I very much enjoyed the chance to work with designer and photographer Iain Sarjeant again, when he asked me to research and write this panel for Raining's Stairs in Inverness. John Raining was born in Dumfries in 1659. He married Frances, had two children, became a successful merchant in Norwich and died in 1722. His Scottish roots and Christian belief must have been important to him, as his will left money to help the poor and pay for a schoolmaster in parishes near Dumfries. He also left a thousand pounds ‘to plant a school in any spot in North Brittain’ for the teaching of ‘the fatherless and other poor children’. Inverness was chosen as the location of the school. The first school that was set up was on the top floor of Dunbar's Hospital on Church Street, but by 1757 Raining’s school, with two teachers and 250 boys, moved into a new building at the top of what is now Raining's Stairs. 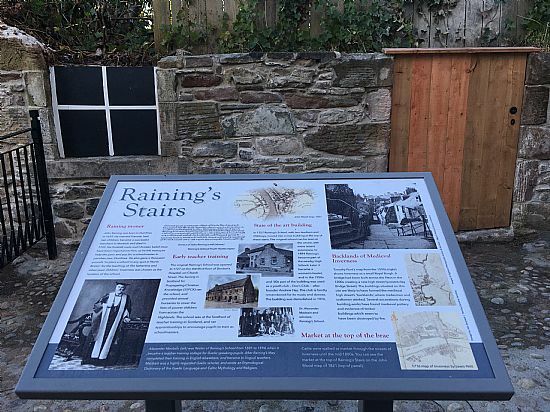 The interpretation board was commissioned as part of the redevelopment of the stairs, and celebrates the achievements of Raining's School, and other aspects of the history of the area.